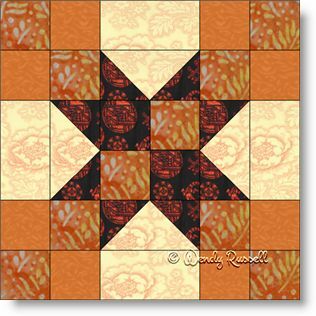 The Checkerboard Star quilt block is a simple nine patch block comprised of simple patches -- the flying geese unit and squares. As illustrated by the sample quilt layouts, an entirely different look can be achieved by setting the blocks on point or a straight set with the blocks side by side. This quilt block shown, was made in a monochromatic style, but would be lovely as a scrap quilt too or by choosing two different colour families.